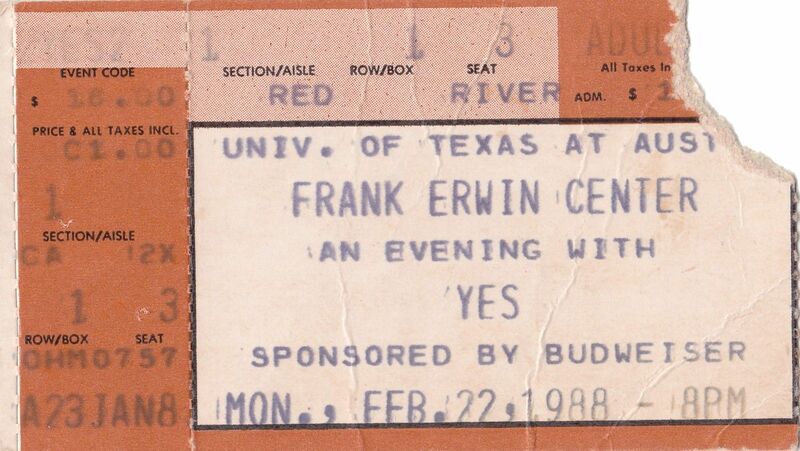 This was probably the worst Yes show I've seen in all my years ('79-'13) of going to their concerts. I will confess that I'm not a fan of the "Big Generator" album, but beyond that this show was a bit of a mess. There were technical problems throughout the show (as Rabin admitted at the end to the crowd), and the band was just generally out of sync. They didn't ever smile at each other on-stage, and the vibe seemed tense. Plus, as others have said, Tony Kaye simply doesn't have the chops to play much of the material from albums he didn't originally play on. A very disjointed show, and one that didn't leave a good taste in the mouth. 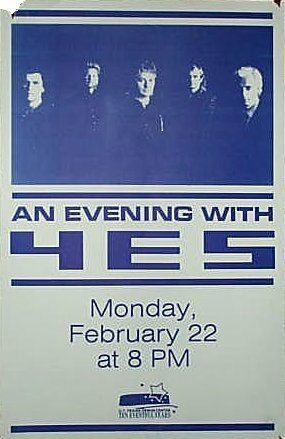 this was my 1st of many Yesshows since becoming a fan in the mid-eighties. i really didn't know what to expect to hear. with the 2 "new Yes" albums, i was afraid that they would not do much from their earlier catalog. over-all i believe they did a good job balancing the set between old and new material. although i do wish they did "I'm Running" and/or "Final Eyes" (2 of the better songs from BG). i also wish that they did "Starship Trooper" in its entirety. overall, i thought it was a very good show. the opening act was old "Popeye" cartoons. i heard that the band did this on the 90125 tour. it was over an hour before YES finally arrived on stage. i guess that Chris was ordering dinner or taking a bath. after the show, i followed the band to the hotel and managed to get Jon, Chris, and Trevor to sign my BG press kit(unfortunately that press kit was to become lost one day). still the 4hr trip to Austin and the show itself was a very memorable experience. even though i think of the world of Steve Howe, i still wouldn't mind seeing Trevor R. back with Yes again. with Yes, you never know. walked up and bought a ticket the day of the show and got 10th row floor right in front of Squire. Good show. better than 90125. they may as well have tossed on the old classics, as TK wasn't able to hang with the likes of RickW. It's just not the same without Howe. I liked this tour. Saw 'em twice: once in Worcester, MA, and once in Austin, TX. Both shows were good, although they were definitely tighter by the time they got to Austin. They played most of BG at the shows I saw (everything except I'm Running and Final Eyes, which they *did* play at some shows earlier in the tour), and quite a bit of 90125. If you like those albums, this was a good tour. The older material, on the other hand, was not particularly well done. 'Heart of the Sunrise', in particular, was difficult for me to stomach, mainly because of Tony Kaye. TR played it well, and in Austin the overall performance was tight, so that was all right, but I really didn't like Tony's "version" of the keyboard parts. (They played it again on the Talk tour, and I was hoping that maybe a little Wakey had rubbed off on Tony, but no luck.) I really disliked their versions of all the old material, frankly. Woo! Thank you so much. Yo. Great to be with you Austin. On the drums Mr. Alan White. Thank you. Thank you very much. Thank you. Thank you so much. Woo! Woo! Thank you. That's..uh a song from the new album and here's a song that we're going to do for you. Trevor's going to sing the song for you. It's from the album '90125'. The song, it's about something we seem to go through so many times a day. The song is called 'Changes'. Thank you very much. Thank you. We are all the eyes of all the earth. We are all the eyes of all the stars. We are all the eyes of all the world. We are the voice. We are the voice of every 'Big Generator'. 'Big Generator'. Big, big big generator. Here's a new song from the new album. The song is..uh sorta me and Trevor. Trevor is singing in dreamtime. I'm singing in reality time. The song is dedicated to beyond war, beyond war. Living beyond war. Thank you very much. Thank you. Woo! Just, I'd like to sing for you a very, very quiet song. It's..uh a couple of years ago, like most people, I thought it would be great to go on an adventure. So over the last couple of years I've been on a sorta adventure. Finding out about a lot of things and one of these things is a song I want to sing for you now. It's a song about our Mother Earth. Thank you very much. Thank you. Helping me, helping me with that song is someone who I've known for many years and we've worked together in many different occasions. A real gentleman and one of the foremost keyboard players of today, Mr. Tony Kaye. For the next few minutes, relax and enjoy the beautiful guitar playing of Mr. Trevor Rabin. Thank you very much. Thank you. Thank you. Here's something from '90125'. Thank you very much. Thank you. Thank you. Thank you so much. Woo! Yeah. We're going to do a duet. That means like two, two people. Muchas Gracias. Two people doing something together like singing a song that you might remember from a long time ago. The amazing bass of Mr. Chris Squire. Thank you. Tonight's a special night for us because..uh we're recording tonight. Thank you.